Oscar Pistorius’ lawyer, Barry Roux, has denied claims the athlete and his girlfriend Reeva Steenkamp were unhappy. Barry Roux emphasized that among hundreds of “loving” text messages, only four showed signs of arguments. The lawyer made his case while cross-examining a police captain who had given evidence about the couple’s mobile phones. Double amputee Oscar Pistorius denies deliberately shooting Reeva Steenkamp last February, saying he thought she was an intruder. The prosecution has now ended its case and the trial has been adjourned until Friday. Defense lawyers say Oscar Pistorius will take the stand, but it is not clear when that will be. The defense is particularly focusing on text messages and calls extracted from the couple’s mobile phones by police Capt. Francois Moller. Oscar Pistorius, 27, previously said he had forgotten the password to his iPhone and investigators went to the US shortly before the trial began to meet Apple officials to try and gain access to it. Barry Roux tried to demonstrate that Oscar Pistorius and Reeva Steenkamp had arguments but these were soon resolved. Many of the text messages exchanged between the couple were affectionate in tone and showed they were in love, the defense argued on Tuesday. The defense also played CCTV footage, earlier broadcast by Sky News, showing Oscar Pistorius and Reeva Steenkamp kissing in a shop. State prosecutor Gerrie Nel later questioned the relevance of the video. On Monday Capt. Francois Moller revealed he had been able to extract some 35,000 pages’ worth of messages from Reeva Steenkamp’s phone. He said that 90% of the messages between the couple were loving, but he had picked out exceptions. The message was sent after Oscar Pistorius and Reeva Steenkamp had a row when he accused her of flirting with another man at a friend’s engagement dinner – weeks before he shot her dead. Correspondents say some of these messages could prove extremely damaging for Oscar Pistorius. Reeva Steenkamp’s messages paint a picture of the athlete as a jealous and possessive boyfriend prone to anger. The texts between the couple also suggest Oscar Pistorius asked Reeva Steenkamp to keep quiet over an incident in January 2013 where he allegedly fired a gun at a restaurant – another charge he denies. “Angel please don’t say a thing to anyone… I can’t afford for that to come out,” he wrote. 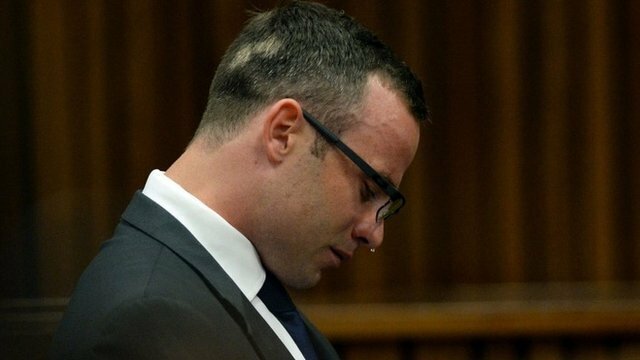 Oscar Pistorius trial was due to end this week but has been extended and will now run until the middle of May. The prosecution says it will call upon four more witnesses before closing its case. The defense team will then call upon its own witnesses, including Oscar Pistorius himself.